Here are some grocery shopping tips for those of us who need to get this chore done quickly, for whatever the reason. One weekly chore I don't really enjoy that much is grocery shopping. I am not a big fan of cooking so I'm not the type to linger in the store looking at all the latest and greatest things to make for dinner. Or all the latest and greatest snack foods I shouldn't be eating! Nope! I'm the type who likes to have a plan, go in, get what I need and get out as quick as possible! I should mention that I also have two young children with me who also like to get out of there quickly, which is even more inspiration for me to get it done fast. The shopping still has to be done right though because if things are forgotten, then there will need to be a repeat visit to the store, and we don't want that! This grocery shopping tip is critical. You can't shop if you don't know what you're going to make and what ingredients you need! I keep this VERY simple and just add it to the bottom of my grocery list. To read more about meal planning and how helpful it is, click here. I have a customized grocery list for the layout of the store I shop at most. I know it sounds like work, but it wasn't that hard and it has paid off big time. On one of my trips to the store I took notes of the aisles in the store and what items were on each. I walked through the store as I usually do, wrote down the most common things I buy from each aisle and made my list based on that. I sat down at my computer, built a little shopping list in a spreadsheet and I print them out as I need them. Now when I walk through the store, I go in order, I don't need to zig-zag back-n-forth through the store, and get done quite quickly! Click here for a blank version of my grocery list. 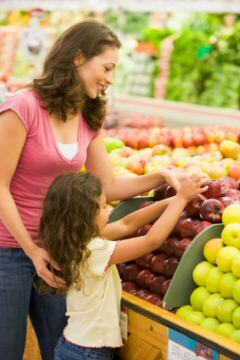 Fill out your grocery list before going to the store! This may seem like a no brainer grocery shopping tip, but it's critical. So, you have this awesome customized shopping list. But if you don't fill it out before you go to the store, it won't do you any good. I keep mine handy at all times to fill in as I realize I need something. Then on the day or two before my shopping trip I plan my meals and add whatever I need to my list to complete it. Do you use coupons? If so, here is a tip on how to organize them for your shopping mission. I pull out all the coupons I'm going to need for the shopping trip I'm planning. I then put them all into an envelope for that particular trip to the store. Make sure they're in the same order as the items on your shopping list. That way as you find the items in the store, you can refer to the coupon if needed, make sure it's going to get used and so on down the list. I do also bring my regular coupon holder, just in case I might need a coupon from it. For more information on how to organize coupons, click here. Do these grocery shopping tips sound like too much work? I hope you give them a try before making that judgement. This may be just what you needed! I enjoy planning my trips to the grocery store, in the comfort of my own home. But I don't enjoy the shopping itself, especially if I'm unorganized and can't find what I'm looking for. Planning ahead makes all the difference!